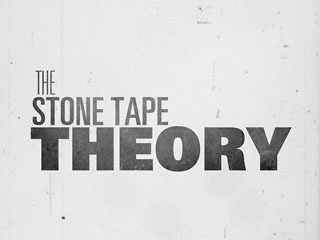 The Stone Tape theory is a paranormal hypothesis that was proposed in the 1970s as a possible explanation for ghosts. It speculates that inanimate materials can absorb some form of energy from living beings; the hypothesis speculates that this "recording" happens especially during moments of high tension, such as murder, or during intense moments of someone's life. This stored energy can be released, resulting in a display of the recorded activity. According to this hypothesis, ghosts are not spirits but simply non-interactive recordings similar to a movie. Paranormal investigators commonly consider such phenomena as residual hauntings. A complicated electro-mechanical mechanism is needed to ensure that the tape is passed through a powerful variable electro-magnetic field which changes the magnetisation of the iron oxide particles coated onto the tape thus storing the sounds & images as a series of magnetic fields. A further complex mechanism is needed to 'read' the stored magnetic fields and return them to a form we can watch or listen to. How any stone recording could be played back and influence later witnesses without this complex machinery makes the stone tape idea almost unworkable. However, a possible hypothesis has emerged that may well explain how an environmental recording might work and it is supported by some scientists. The answer could lie in a substance that is a part of just about every location where ghosts are to be found - common water! Water it appears from research being undertaken may even be capable of recording both human thoughts & emotions. The notion that water might be able in some way to the record emotions or impressions of past lives is itself not a new one. In the early 1960's Archaeologist and later psychical researcher T. C. Lethbridge together with his wife had a series of powerful experiences of "depression and fright" whilst walking close to a small stream on the beach at Ladram bay, Devon. He discovered that a suicide had taken place at the site some years before. Further research and experiences at other sites associated with water lead him to develop a theory that the water was able to record strong human emotions and that these may later affect subsequent visitors to the site.